Skyfire 2.0 for Android Does Flash Video in Web Browser! The popular Windows Mobile and Symbian browser which can pull Flash and Silverlight (soon on Android) content on cell phones has finally arrived on Android platform. Skyfire, which has been around for quite some time now has proved itself to be a potential browser for Nokia and Windows phones. It is probably the only browser which can pull off Flash video without any hassle. YouTube or Facebook videos, you name it, Skyfire will pull it off. Skyfire for Android hosts a lot of cool features, some of them are as follows. SkyBar- SkyBar brings the best of the Internet to a mobile user’s fingertips, without any additional searching. By activating the SkyBar with a single touch, users are given access to any broken embedded video, related content, as well as the ability to share content to their social networks. Video –The “Video” icon repairs any broken Flash and rich-media video content embedded within a webpage. Goodbye, question marks and blue Legos. Related Content – The “Explore” icon brings the most relevant content on the Internet to a user’s fingertips based on what they are viewing at the time, without the need for arduous time spent typing in often unreliable mobile searches. The related button pulls video, buzz, news, images and other sites from the web based on what is on the current page. Sharing – The “Share” icon lets users update their social network profiles like Facebook and Twitter with a single click. To make this whole Flash deal possible, Skyfire uses cloud computing technology to render all the flash content on it’s own dedicated Skyfire servers, therefore they’re more optimized for your handset and the performance is just great, without trashing or consuming a lot of your data package. All these great features are yours for the taking on your Android device! Give the browser a shot and tell us what you think about it. You can download Skyfire for Android by following this link. It's a feast of web browers now available on the Android platform. The 3 great browsers: WebKit, Fennec (Firefox), and now Skyfire, all on Android. 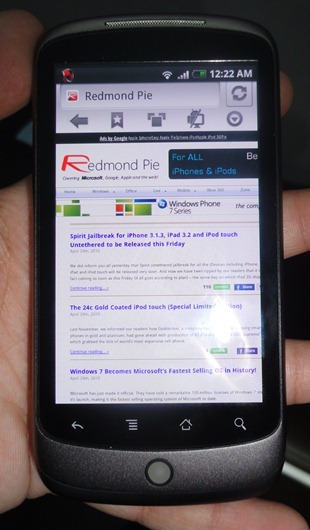 This contrasts with the mono-browser policy that Microsoft is enforcing on Windows Phone 7. Microsoft has chased away all browser competitors (read the stories about why Mozilla abandoned Windows Phone 7). That means the only browser remaining will be Internet Explorer, which is the slowest of all. What's worse is that IE Mobile will be based on a 5-year-old version of IE7. It will be a very disappointing and slow browsing experience on Windows Phone 7.